when sold may be worth more or less than their original cost. Performance – The performance data given represents past performance and should not be considered indicative of future results. General market conditions and or economic conditions can have significant impact on the performance of this composite or your individual investment. Principal value and investment return will fluctuate, so that an investor’s shares when redeemed may be worth more or less than the original investment. The separate account is not FDIC-insured, may lose value and is not guaranteed by a bank or other financial institution. Our separate account performance data is reported as a “composite” of similarly managed portfolios. As such, investors in the same separate account may have slightly different portfolio holdings because each investor has customized account needs, tax considerations and security preferences. These performance results contain portfolios that reinvest dividends and interest as well as portfolios that withdraw all or a portion of this income. 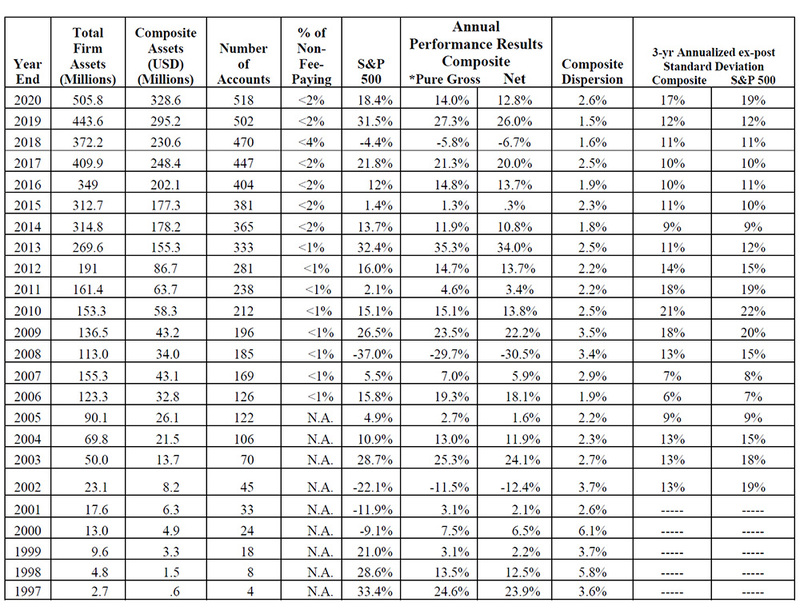 Index Comparison – We have compared our composite performance to the S&P500 index. This index contains 500 widely held stocks and is often used as a proxy for the stock market. Your portfolio may fluctuate more or less than this index. An investor cannot invest directly in an index. Risk – Diversification does not assure profit and will not necessarily protect against loss in a declining market. Alpha: Alpha measures the difference between a separate account’s actual returns and its expected performance, given its level of risk (as measured by beta). Alpha is often seen as a measure of the value added or subtracted by a portfolio manager. Beta: Beta is a measure of a separate account’s sensitivity to market movements. A portfolio with a beta greater than 1 is more volatile than the market, and a portfolio with a beta less than 1 is less volatile than the market. Down-Market Capture Ratio: This ratio is the direct opposite of the up-market capture ratio, gauging performance of the manager relative to the index in down markets. A ratio value of 80 would indicate the manager has declined only 80% as much as the declining overall market, indicating relative outperformance. Disclosure – © 2018 Morningstar. All Rights Reserved. The information contained herein: (1) is proprietary to Morningstar and/or its content providers; (2) may not be copied or distributed; and (3) is not warranted to be accurate, complete or timely. Neither Morningstar nor its content providers are responsible for any damages or losses arising from any use of this information. Past performance is no guarantee of future results. For each fund with at least a three-year history, Morningstar calculates a Morningstar Rating™ based on a Morningstar Risk-Adjusted Return measure that accounts for variation in a fund’s monthly performance (including the effects of sales charges, loads, and redemption fees), placing more emphasis on downward variations and rewarding consistent performance. The top 10% of funds in each category receive 5 stars, the next 22.5% receive 4 stars, the next 35% receive 3 stars, the next 22.5% receive 2 stars and the bottom 10% receive 1 star. (Each share class is counted as a fraction of one fund within this scale and rated separately, which may cause slight variations in the distribution percentages.) The Overall Morningstar Rating for a fund is derived from a weighted average of the performance figures associated with its three-, five- and ten-year (if applicable) Morningstar Rating metrics. Sycamore Growth and Income Equity was rated against the following numbers of U.S.-domiciled Large Blend Category funds over the following time periods: 524 funds in the last three years, 472 funds in the last five years, and 353 funds in the last ten years. With respect to these Large Blend Category funds, Sycamore Growth and Income Composite received a Morningstar Rating of 4 stars, 4 stars and 4 stars for the three-, five- and ten-year periods, respectively. Past performance is no guarantee of future results. © 2019 Sycamore Financial Group.All other trademarks are the exclusive property of their respective companies. *Pure Gross returns are shown as supplemental information. See below for additional important disclosures. The Sycamore Growth and Income Composite was created September 30, 1996. Sycamore Growth and Income Composite contains only fully discretionary growth and income equity accounts that invest in securities on the Sycamore approved trading list, (which consist only of common and preferred stocks) and for comparison purposes is measured against the S&P 500 Index. The minimum account value for inclusion in the composite is $100,000, as of October 1, 2013, If for any reason a portfolio falls below $60,000 for 2 consecutive quarters it will be removed from the composite. Verification assesses whether (1) the firm has complied with all the composite construction requirements of the GIPS standards on a firm-wide basis and (2) the firm’s policies and procedures are designed to calculate and present performance in compliance with the GIPS standards. The Growth & Income composite has been examined for the periods September 30, 1996 through December 31, 2017. The verification and performance examination reports are available upon request. The investment management fee schedule for the composite is 1.5% on the first $0.5million, 1% on the next $1 million, 0.8% on the next $8.5 million, and .6% on amounts above $10 million. Actual investment advisory fees incurred by clients may vary. We have compared our composite performance to the S&P500 index. This index contains 500 widely held stocks and is often used as a proxy for the stock market. Your portfolio may fluctuate more or less than this index.